At National Spring, we believe having the right truck parts on hand for your vehicle is just the beginning of our outstanding service to our customers. Our team of professionals will help diagnose the problem, identify the correct part you need, and provide service to restore your vehicle. We keep over 5,000 parts in stock to ensure our customers are properly taken care of from the time you come through our doors, to the time you’re driving out of our parking lot. 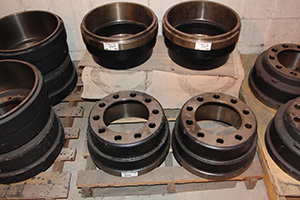 We supply spring and suspension parts, brake parts, kingpins, tie rod ends, ball joints, and more for pick-ups, medium and heavy duty trucks, and trailers. National Spring also specializes in providing parts and services for municipal and fleet vehicles, including plow trucks, school busses, fire trucks, ambulances, and garbage trucks. Give National Spring a call today and we’ll ensure the parts you’re looking for are your hands in to time. If you are unsure of the part you need to get your vehicle in working order again, our staff will be happy to assist.